Beta Andromedae, also known as Mirach, is the central figure of this image. Mirach is a red giant close to the end of it’s stellar life. It is about 100 times larger than the sun, and about 2000 times brighter. 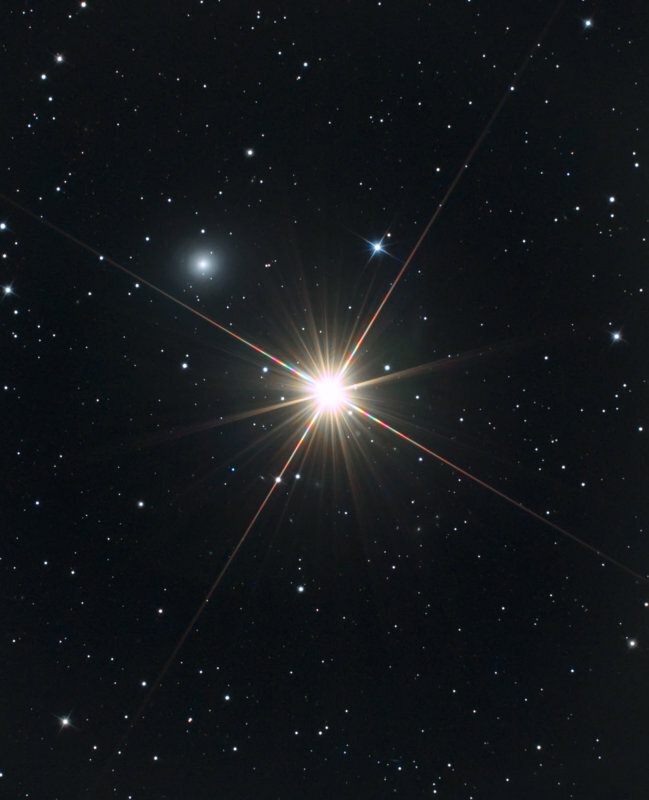 Mirach is often used as a pointer star to the Andromeda Galaxy. Above and to the left of Mirach is what appears to be an apparition or ghost of the star. Hence it’s name, Mirach’s Ghost. This is actually NGC 404, a dwarf lenticular galaxy discovered in 1784 by the British astronomer, William Herschel. NGC 404 is thought to have once been a spiral galaxy, but has since become a lenticular through a galactic collision about 1 billion years ago. The light creating this image left Mirach some 200 years ago. As for it’s ghost, NGC 404, those photons have been traveling for 10 million years. NASA APOD image for October 27, 2017. Published in September 2018 issue of Sky and Telescope.